We hired a photographer to snap some aerial shots of our Stadium Auto Center site - below is one of the photos with the site outlined in blue. 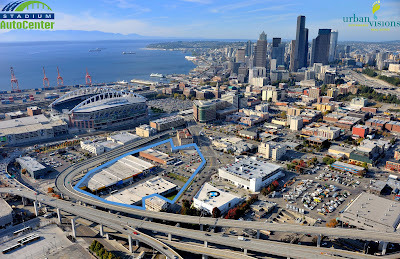 The idea behind Stadium Auto Center is to embrace the green car movement while leveraging BMW of Seattle's new $40,000,000 investment to the East. Given the site's exposure, proximity to the city, and easy access to all major modes of transportation, we are receiving an incredible amount of interest from the automotive industry. Expect some exciting announcements in the future as this concept evolves. For more information, please feel free to contact us direct at (206) 262-2880.